Renee Patrick at The Poisoned Pen! 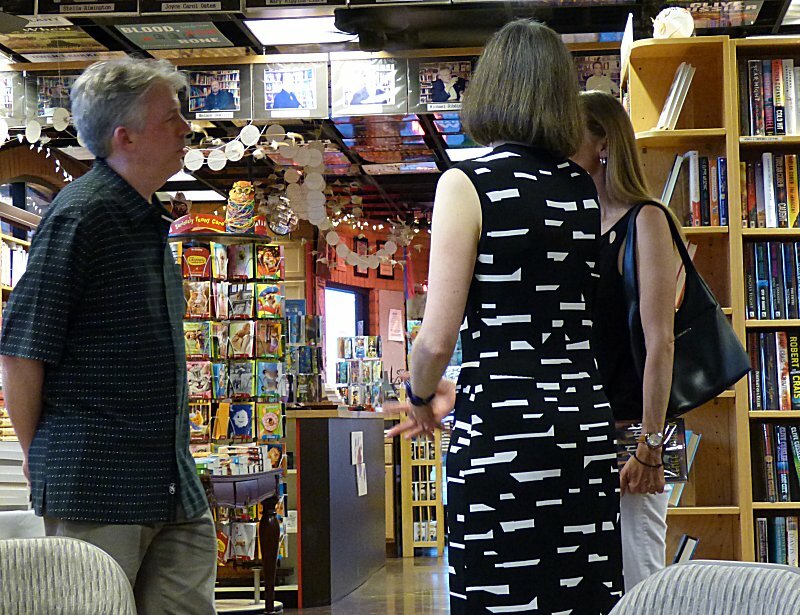 Tuesday, May 3, found me in the Jeep and headed for my favorite bookstore, The Poisoned Pen. It was a rather fraught journey, since some of the drivers seemed to believe no one else was on the road with them, bless their hearts. After some delays, I thought I was in the homestretch, but no! I was almost sideswiped. Twice. Two different drivers became impatient at being behind a huge delivery truck and decided to change lanes to get around it. Unfortunately neither looked to see if anyone was already in the other lane. There was. Me. By the time I got to the bookstore, I was beginning to think the Jeep had at least one bull's-eye painted on it. Needless to say, I was thrilled to make it to my destination in one piece to see Vince and Rosemarie Keenan, AKA Renee Patrick. 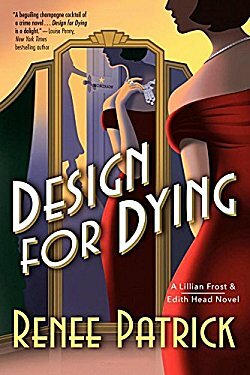 I had attended a panel they were on at Left Coast Crime, but I'd enjoyed their first Lillian Frost and Edith Head historical mystery, Design for Dying, so much that I wanted to see them again with several hundred less people around. Whenever I attend an event, I always hope it's crowded. I want my favorite authors to sell a lot of books so they'll keep writing what I like to read. I'm not being generous or helpful; I'm being selfish! But I have to admit that sometimes a smaller group of people can be a lot of fun. That's what happened this time around. 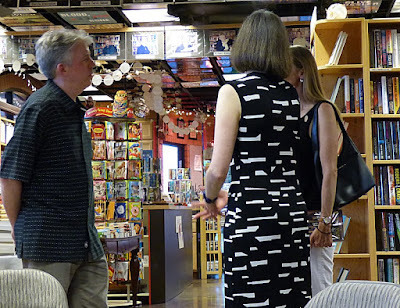 Vince and Rosemarie were happy to see fellow (local) author and friend Anne Wilson, and everyone got a chance to stand around and chat before the event began. One of the pre-event chat groups. L to R: Vince Keenan, Rosemarie Keenan, Anne Wilson. The Keenans are on a rather busy schedule. They are from the Seattle area and had attended Malice Domestic in Washington, DC. Now they were winding their way home, stopping here in Phoenix before spending the weekend in Seattle... and then flying to New York City. I'm sure I'm not the only one who enjoys it when authors bring their own props. In this case the Keenans brought a book of Edith Head paper dolls so we could see some of her fashion designs. 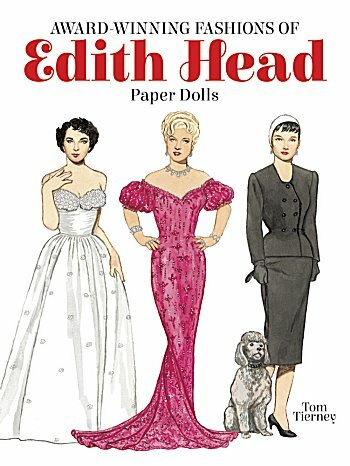 We also got to share any Edith Head stories we might have had. Mine was finding out about this eight-time Academy Award winner when I watched the credits roll at the end of "The Sting." (I loved the graphics that were used.) When I saw Head's name, I thought, "Wow, what a cast she had to work with!" (Paul Newman, Robert Redford, Robert Shaw... to name three.) Just seeing her name made me curious. 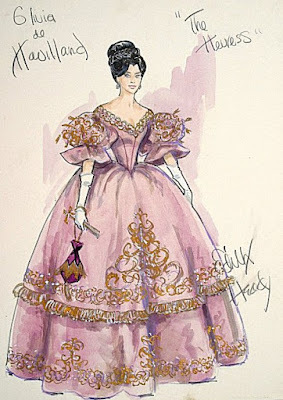 I looked up information on her, began looking for the movies she'd designed costumes for, and read a biography or two. Don't you love it when one small thing can lead to so much pleasure? Edith Head began working for Paramount Pictures in 1924, the same year Gloria ("I'm ready for my closeup, Mr. DeMille") Swanson made her triumphant return to the studio. One of the first things Head had to do-- along with everyone else at the studio-- was throw rose petals at Swanson's limo as she was driven through the lot. Rosemarie and Vince Keenan showing us some of Edith Head's costume designs. When asked why they chose to center a mystery series around Edith Head, Vince said that they do a lot of work for the Film Noir Foundation, so they already have a love of classic films. They chose Head because she had a very long career, and she worked with so many different people: Hitchcock, Billy Wilder, Audrey Hepburn, Grace Kelly, Elizabeth Taylor, and on and on and on. Since this brilliant costume designer usually worked twelve to fourteen hours a day (often seven days a week), they knew her character wasn't going to be able to do all the investigating herself, hence Lillian Frost-- a young woman who came to Hollywood to be a star. "Edith is like a distaff Nero Wolfe, always stuck on the lot," Rosemarie said. "There are three biographies of Edith Head, two of which she wrote herself," Vince said. "None of them agree, which is good news for us as we write each book!" The Keenans have made research trips to Paramount Studios; their work for the Film Noir Foundation having opened doors for them. The person helping them pulled out blueprints of the wardrobe building so the two could tell exactly where all the rooms were located. They were allowed in the costume archive and touched one of Barbara Stanwyck's costumes from "The Lady Eve." They were thrilled. "You always hear about how small actors are," Vince said. "Stanwyck was tiny!" "If you only know her from the television series 'The Big Valley,' you've got a lot to learn," Rosemarie added. The most surprising fact Rosemarie Keenan learned about Edith Head during their research was "her sentimental side. She pressed flowers between the pages of the letters her husband wrote to her." Obviously everyone there was fascinated by the Golden Age of Hollywood, and we soaked up everything the Keenans told us. 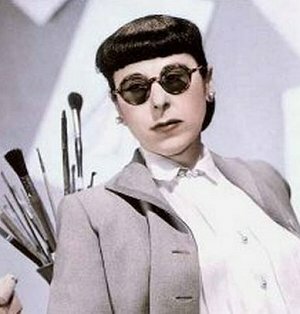 Edith Head was hired as a sketch artist and worked her way up. You learn more about her career in the pages of Design for Dying. "Edith Head invented the brand before anyone knew what branding was," Vince told us. "Her best costume was the one she's known for wearing: the conservative, impeccably tailored suit, the dark glasses, her hair worn in bangs across her forehead. When Art Linkletter made the transition from radio to television, Edith Head had her own regular segment. She was really the first fashion consultant." When television began making inroads on the movies, Head was asked about the difference in the movies that were now being made. "They stopped making movies you can dream about," she said. Rosemarie Keenan has liked old movies since she stayed home sick from school as a child and watched the original "King Kong" all week. When asked about some of her other favorite movies, she listed "The Palm Beach Story," "Casablanca," "Strangers on a Train," and "42nd Street." She's a huge Ruby Keeler fan. On the other hand, Vince's favorite movies are from the 1970s: "The Taking of Pelham 1 2 3," "Chinatown," and "The Conversation," although now he would include 1940s film noir. Their next Lillian Frost and Edith Head book? Dangerous to Know, which is the title of a 1938 film that Edith Head did. (Due April 2017.) The book kicks off with a real Hollywood scandal involving several Paramount stars. Current events in Europe are also touched upon with the influx of exiled actors and filmmakers. What do they like to read? Rosemarie likes traditionalists like Rex Stout and Agatha Christie, with Lee Child thrown in for good measure. Vince? Lawrence Block and Donald Westlake. These two both like the research involved in writing their books, and if they have any disagreements, it's usually about the jokes one of them wants to use. "The major part of this job has been inventing Renee Patrick," they said. "We have a tendency to treat her like a real person... say Meryl Streep in 'The Devil Wears Prada.'" They work on the plot together, which means a lot of discussion. One of them will then take the lead on writing the first draft, with more discussion throughout the writing process. Once the first draft is done, they have two copies of it made, and they each read through it. That's when most of the disagreements occur. "Kinkos loves us because we always need two of everything," Vince laughed. They are trying to be faithful to the time and to the films of that period, and it's only natural that they would wonder how Edith would feel about being turned into a sleuth. "I wondered until I found something in the archives one day," Rosemarie said. 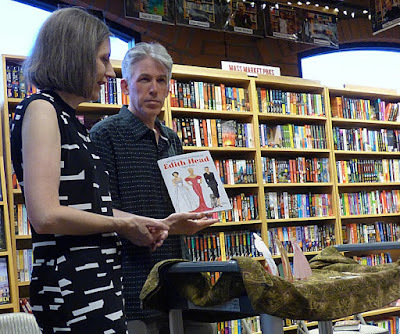 "It was a handwritten list of Ed McBain titles that she had to buy. That told me that Edith Head wouldn't mind being in a mystery." Having read Design for Dying, Rosemarie, I agree with you. I admit I haven't read this post yet, but two things pop out at me: the Design for Dying cover is great. Also, the Poisoned Pen book shelves look very inviting, neat and clean. I have dust allergies and dread some bookstores only because of that reason, and this superb store looks super-clean and well-organized. Wish it was around the corner! So glad you had such a great time, Cathy! And I always like hearing the stories behind the the stories, so to speak. So what the authors have to say is really interesting, too. Loved this post, especially since I wasn't familiar with the series, but I really enjoy old black and white films. Thanks for giving me a series to check out in the future. I read the post; evening sounds delightful. Who would have thought of Edith Head featured in mysteries? This interesting couple did so. And that cover is a good one; a clever artist designed it. Yes, I'm looking forward to seeing the cover of the second book in the series.